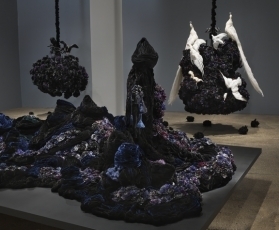 Galerie Lelong & Co. is pleased to announce its new podcast series, “Viewpoints, with Galerie Lelong & Co.” The premiere episode—available now on SoundCloud, Apple Podcasts, Stitcher, TuneIn and Google Play—features a conversation between artist Petah Coyne and Mary Sabbatino, Vice President/Partner at Galerie Lelong & Co.
​Over the next several months, this podcast series will explore new stories and start new stories and start new conversations with the artists, curators, and thought leaders who inspire us at Galerie Lelong & Co. Averaging 15 to 30 minutes in length, forthcoming episodes will include discussions with artists from the gallery’s roster, behind-the-scenes details on new exhibitions, and conversations related to the past, present, and future of Galerie Lelong & Co. and its artists. Click here to listen in Soundcloud.